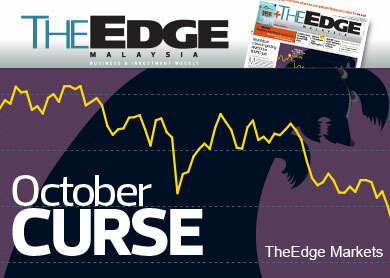 KUALA LUMPUR (Oct 18): The global stock market sell-off amid lower crude oil prices have opened a window of investing opportunities, The Edge Malaysia business and investment weekly (Edge Weekly) reported in its latest October 20-26 issue. The Edge Weekly quoted analysts as saying the FBM KLCI's decline to below 1,800 points offered money-making opportunities until the first quarter of 2015. “Malaysian fundamentals are still intact. Is it a buying opportunity now? It sure is. The benchmark FBM KLCI has fallen below 1,800 points and this is a good time to buy. "I believe there is money to be made in the market until the first quarter of 2015,” an equity researcher was quoted as saying. For now, the Edge Weekly said key question was at what level would global equities bottom and when. The Edge Weekly said there was no clear answer at this juncture, only indicating that the equities correction was not about to end soon. "Market observers are unable to predict how much further the indices will fall, except to say that the correction this time around is not about to end soon. The correction could be timely, or even healthy, given that the indices have been rallying since 2009, they add. "The investing community sees the falling crude oil prices as a trigger for the stock sell-off," the Edge Weekly reported. Brent crude oil prices have fallen to some US$84 (RM275) a barrel from US$115 in June this year. This was in anticipation of weaker demand and higher supply of oil in the world market. Analysts noted that lower crude oil prices offered a silver lining against the current backdrop. The Edge Weekly quoted AllianceDBS Research Sdn Bhd research head Bernard Ching as saying said cheaper crude oil might benefit certain sectors like the aviation industry, As such, airline shares will be closely watched in anticipation of lower jet fuel prices. “One of the beneficiaries of lower crude oil prices is the aviation industry,which we expect to report better margins in its seasonally strong fourth quarter," Ching said. For a better understanding on global equities and oil market dynamics, and their impact on Malaysian stocks, kindly pick up and read the latest issue of the Edge Weekly.